None of us are fully formed in our relationship with Christ, regardless of our chronological age. Adult Education and Formation is designed to enrich and enhance our journeys as we move closer to God. Some past initiatives include Herbert O'Driscoll's "Opening the Collects", as well as a published collection of meditations by parish members. If you have an idea or spiritual discipline you'd like to share with the parish, please feel free to share it with a Vestry member or Clergy. As a small congregation, the children are an integral part of our church, and we appreciate their participation in our weekly services. 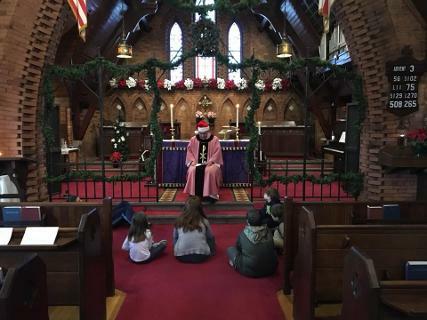 The younger children assist in the collection and bring up the offertory gifts, while our older students serve as acolytes, ushers, and readers. 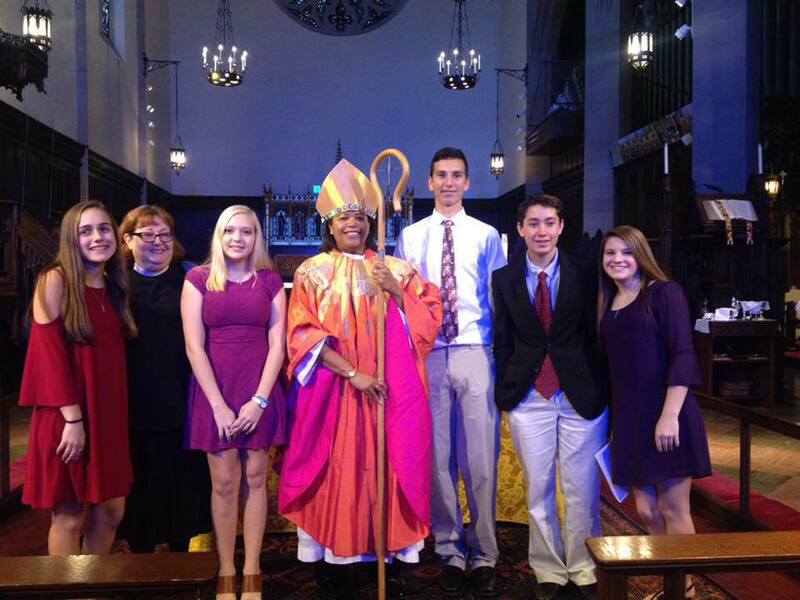 Other youth-oriented programs are offered throughout the year, including family services, acolyte training, and various outreach projects. All of our children are invited to participate in the annual, and much beloved, Christmas Pageant. Christ Church identifies itself as a faith community focused on the needs of today’s family. Our intent is to provide the children with a solid Christian education while also helping them to develop an understanding of, and appreciation for, church community. If you are interested in learning more about our church school program, please contact the church by clicking here. I want to tell everyone about the thoughtful, candid, and insightful discussion and discernment that took place at Tuesday night's parent meeting. We looked at the past year, reviewed the reasoning behind changing our format from 4 Sundays to 2, and began brainstorming for the program to start this fall. The parents present took a close look at the very structure of church school as we've always known it and considered whether it is a sound approach for our children today. As you all may know, last year's changes grew out of a national trend toward reexamining these very things. An article we found particularly provocative can be revisited here. Today's child does not learn and process the way they did 20 or 30 years ago and our goals are not the same anymore. At the time that this model of approaching Sunday School was introduced, it was the parent that the church was trying to get to church each Sunday. Today, we are trying to give our children a solid foundation in church life and an experience that will make them more likely to continue a disciple's life journey after they reach adulthood. Most parents reported their children having less than positive feelings about the content/level of engagement during church school, as well as a lack of interest in following along while in church. Additionally, teachers recognize that getting kids engaged in and making connections with curricular content can be an uphill battle. The struggles of a small church ­ we just don't have enough teachers, and so it ends up that children are taught by their parents until they age out of Sunday School and the next set of parents takes the torch. Additionally, the kids don't get many opportunities for new experiences with new faces, i.e. youth groups and mission experiences that introduce them to new people and broaden their world view. be the heart of our hopes for our children. The discussion turned to how then we would go about trying to accomplish these goals and agreed that the approach can have many layers. Given that teacher numbers are very low and the old format just isn't working for us, we considered a model where the church school met once a month during church (1st Sunday of the month to keep it simple) to have fellowship and learning experiences, drawn from various curricular resources, but with a focus on giving the kids materials for the remainder of the month to do on their own and with their families. The church services for the rest of the month would be family friendly, with opportunities for child participation and materials in church for kids to access and use during the service (fidget items, children's bibles, coloring pages having to do with lessons, activity sheets, etc.) Some of the materials for a given month could include, but not be limited to, dinner conversation starters, calendar­driven suggestions for field trips and faith­based experiences, keeping a faith journal, reading and responding to bible passages or moral scenarios, etc. Teachers and interested parties can meet a few times over the course of the year to thoughtfully and creatively pull together and produce materials for the kids. A parent/child book study of Madeleine L'Engle's Time Quintet series, which revolvesaround the theme of faith. Parents and children would read the books separately and then meet with the group for discussion and fellowship. Pairing a student with a willing senior member of the congregation and supplying them, monthly, with passages (or supplying them with monthly passages) to read and reflect on. Then having a scheduled telephone conversation together to share thoughts and perspectives ­ giving communication experience to kids, an opportunity for them to value and receive the perspective of an older person, and forge inter­generational relationships within the parish community. A weekly text message from the church school teachers with inspirational quotes or reflections to remind older kids that their church community is with them, thinking of them, and supporting them through adolescence's many social challenges. Snapchat filter challenges ­ such as a "caught doing something good" thread that the kids can maintain and cheer each other on. Scheduling a calendar­driven arts and crafts activity during coffee hour once a month for kids to enjoy fun, social time together after church. Exploring the possibility for our older, middle school and high school, kids to link up with a neighboring church's active youth group ministry ­ a collaboration that would afford them the opportunities for new friendships and mission experiences that our small size limits on our own. I feel very excited and optimistic about this shift and I know our little parish is not alone as we take a closer look at how we approach our children's spiritual formation. I know everyone is busy, but I hope you'll email me with your thoughts and ideas in the next couple of weeks about our journey forward. For anyone who'd like to assist in the shaping of this innovative approach to this year's curriculum, please join me on Sunday, September 11th​ after church to select the materials and activities for the fall months. (The Patriots don't play until 8:30 that night!) We'll plan to begin meeting the first Sunday in October! I very much look forward to collaborating on this with you, on our children's behalf.